A wood thrush sings its flute-like song from a low branch in the forest. Nature’s sounds of summer are many, but a very special one is the famous flute-like song of the wood thrush in our local woods. The wood thrush (Hylocichla mustelina) is a bird of forests, not feeders, but you might not have to go deep into the woods to hear its lovely song. Wood thrushes make use of fragments of forest as well as deep woods. Think, for example, of the woods bordering the railroad tracks in town, or the woods near a conservation area parking lot. Wood thrushes are moderately tolerant of forest fragments. In this way they are different from another forest bird, the scarlet tanager, which needs large, unbroken tracts of forest. What should you listen for? 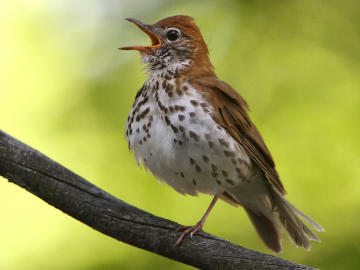 The wood thrush’s song is flute-like. You’re likely to catch the brief but distinctive sound that is often described as “ee-oh-lay.” This loud phrase is actually the middle portion of the song. The song’s introductory notes and final trill are soft and do not carry as far, so they are harder to hear. To know what to listen for, find the wood thrush’s song online. Why do they sing? As with so many other birds, males sing to stake out their breeding territory. They fly around the territory and sing from different locations to let other wood thrushes know what area they claim as their own. Near the border of a territory, two male wood thrushes may come as close as 10 yards of one another and sing back and forth, in a sort of duel. (You may have heard other birds, such as cardinals or chickadees, doing the same sort of thing.) Females sometimes sing a shorter, softer version of the song, as their way of defending the territory when there’s a disturbance near the nest. Wood thrushes are known for singing especially early in the day (about when the robins start) and especially late in the day. Dawn and near dusk can be good times to hear them, as well as daytime. Once you tune into their song, you may realize that you’ve heard it without realizing it. The song often seems to be one of the distant, echoing background sounds of the forest in daytime. Wood thrushes sing their lovely songs thanks to their remarkable voicebox, which differs from ours. Like other songbirds, wood thrushes have a voicebox (called the syrinx, as opposed to our larynx) with two branches that they control independently (via different nerves). Wood thrushes are so good at controlling these two left and right halves that they can sing two different notes either separately or at the same time. It’s as if they can sing a duet with themselves. Male wood thrushes sing 4-8 versions of middle “ee-oh-lay” part of their song. As they mature, young male wood thrushes learn this portion of their song from hearing other wood thrushes, according to researchers. The beginning and end portions, however, may either be determined by the bird’s genes or made up by the bird. The songs of different wood thrushes may seem basically alike to most people, but not to other wood thrushes. What about seeing a wood thrush? This can be harder to do than hearing one. Look low, rather than high in the treetops. These birds feed on the ground in forests, poking around in the leaf litter searching for caterpillars, beetles, grubs, and insects. It’s no accident that they’re well camouflaged with dull colors and spots that make them hard to notice in this setting. Males and females are similar-looking. They’re cinnamon brown on top, and underneath they’re white with lots of well-defined dark spots (as in our photo). If you spot a wood thrush perched on a low branch, you might notice that it has a pot-bellied shape. Wood thrushes nest in shady, moist areas of forest, not far from water. They build their nest in a fork on a low branch (5-20 feet high) of a sapling or shrub. A pair sometimes nests a second time, usually near the first nest. In this case, the male feeds the young for a while after they’ve left the nest, while the female works on building a second nest and laying eggs. After the nesting season, wood thrushes need to fuel up for their migration south to forests in Mexico and Central America. Their diet shifts to include more wild fruits and berries, so they may seek out forest edges and shrubby areas to find the right types of plants. Virginia creeper, various wild dogwoods, and spicebush are some of their favorites in our area. Wood thrushes are well known and loved as summer birds of eastern forests in the U.S., but their populations have been declining. They are not endangered, but Mass Audubon notes a declining trend in their numbers in Massachusetts since 1980. In the eastern U.S. overall, their numbers have declined about 2 percent per year 1966-1999. Why? Part of the answer may be that the forests where they live are under pressure, both in the U.S. where they breed and in Central America where they winter. Forest fragmentation due to development can create problems at our end. Deforestation (for agriculture and development) in Central America also creates difficulties, especially for birds that tend to return to the very same spot every winter, as wood thrushes do. The wood thrush is celebrated for its song, but a couple of birds that are easier to see – our American robins and eastern bluebirds – are also in the thrush family (Turdidae). This makes sense when you realize that robins and bluebirds also have melodious songs. Enjoy the fresh beginnings of summer, and make summer even better by listening for wood thrush song in both large and small wooded areas. You might hear the song in surprising places. And remember to cherish the woods that we have and all the life that fills them.